Posted by Michael Reedy on November 9, 2018 in Soccer, Sports. For the first time in school history, the Ferris women’s soccer team can say they won an NCAA Division II Tournament game. The number three seeded Bulldogs took down number six seed McKendree University Bearcats (Illinois) in a 2-0 shutout Thursday, Nov. 8, advancing Ferris into the second round of the tournament. 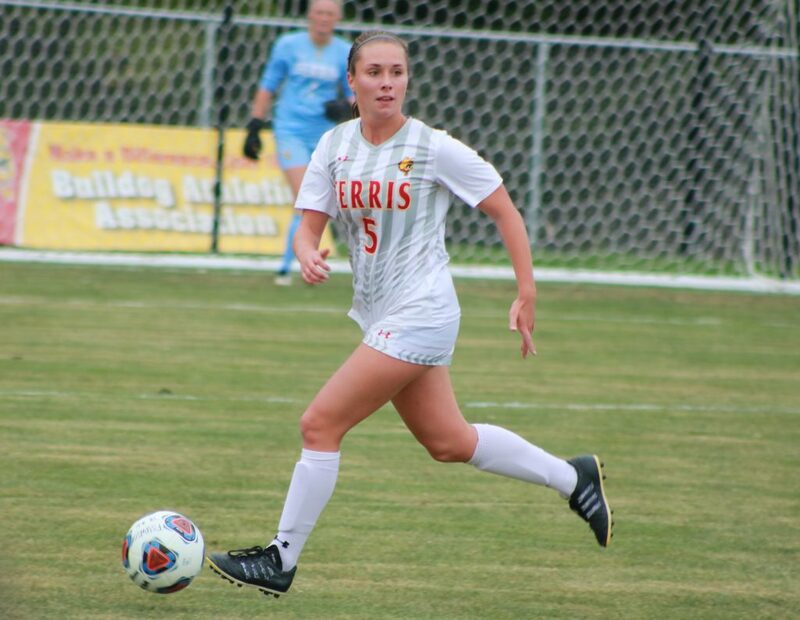 It did not take long for the Bulldogs to get on the scoreboard, as Ferris freshman forward Pia Nagel netted her ninth goal of the year coming off a pass from Ferris senior defender Carley Dubbert. The rest of the first half was hotly contested, but neither team managed to score. A big part of that on Ferris’ side was junior goalkeeper Alison Chesterfield, who acted as a brick wall in net, saving five shots. The Bulldogs had a heavy offensive presence during the second half, which made it difficult for the Bearcats to have any opportunities, only able to get one shot off. Tensions remained high with the whole stadium knowing at any point the Bearcats could play a ball well and make it a tie game. During the 62nd minute, Ferris junior defender Tia VanSuilichem eased the tension of the fans and the team, extending the Bulldog lead to 2-0. The Bulldogs kept the pressure on and had opportunities to get an insurance goal in the final minutes, but would settled with the two goals that they had. Thursday marked many firsts for the Bulldogs as they not only played in, but hosted their first NCAA Division II regional tournament game. The Bulldogs’ record will remain at 15-3-3 on the year, but they gain a 1-0 record in postseason play. As for the Bearcats (13-5-1), their season ends with a first-round loss. Ferris’ second round test will be the second seeded Ohio Valley University Fighting Scots (Vienna, West Virginia), who took down the Bulldogs’ Great Lakes Intercollegiate Athletic Conference (GLIAC) opponent Ashland 1-0 in the first round. Ferris will have to contain the physical team that the Fighting Scots (17-2-3) are while possibly using their aggressive play against them, as their opponent has accumulated 38 yellow cards and one red card over the course of their 22-game season. The Bulldogs are back noon Saturday, Nov. 10, hoping to add to their historic season and advance to the regional finals.